If you’ve decided on an internal level that you are most definitely interested in acquiring the Samsung’s Galaxy S8/S8+ when it arrives, but have made it your mission to learn more about the device prior to launch, then you’ll be delighted with the speed at which leaks are hitting the public domain. As manufacturers look to make devices smaller, lighter, and thinner, the existence of any new flagship is undoubtedly going to bring about discussion relating to size. Thanks to a set of new leaks by Steve Hemmerstoffer, we now have a very good understanding of how the S8 and S8+ will stack up against Samsung’s older handsets, and – you guessed it, Apple’s iPhone 7 and iPhone 7 Plus. Rather than providing any in-depth technical information, or high-resolution images or renders of the upcoming hardware, Hemmerstoffer has presented a series of wireframe style images which instantly give us an excellent understanding of how the Galaxy S8 and S8+ stack up against devices like the Galaxy S7, Note 7, and even a flagship from earlier generations, the Galaxy S6. 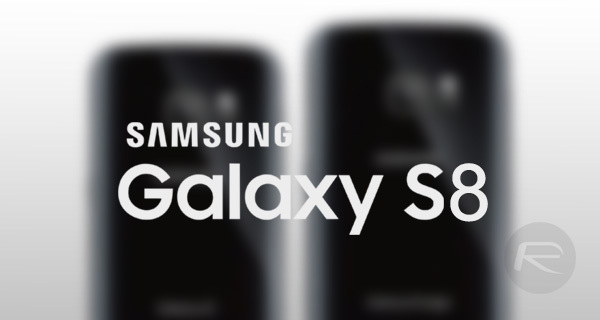 Going from the images alone, you can immediately see that the new Galaxy S8 is slightly narrower than the Galaxy S7 and Galaxy S6, coming in at 68mm compared to the 69.9mm and 70.5mm of the S7 and S6 respectively. The larger Galaxy S8+ will sit at 74mm, which is the widest of all of the devices compared, but only by 0.1mm compared to the explosive Galaxy Note 7. The Galaxy S8+ will also be the tallest of the devices at 159mm compared to the 153.5mm of the Galaxy Note 7 phablet. 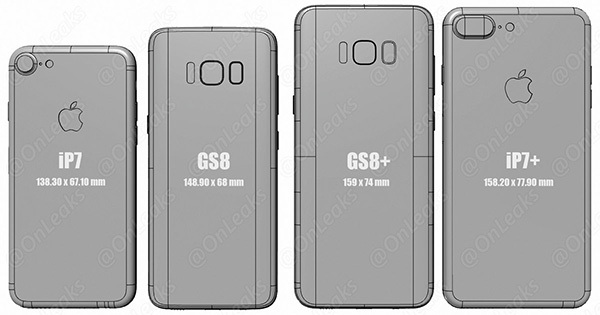 For comparison, the Galaxy S8 will stand at 148.90mm tall, whereas the Galaxy S7 and Galaxy S6 stood at 142.4mm and 143.4mm. What’s particularly interesting is that the Galaxy S8 will pack a 5.8-inch display, whereas the previous model, the S7, shipped with a 5.2-inch panel, but will only add approximately 6mm to the overall physical length of the hardware whilst actually being narrow than both previous S generations. If screen-to-body ratio is a big thing for you, and you may be considering purchasing last year’s iPhone over Samsung’s upcoming hardware, then the posted comparisons between the new S8/S8+ and Apple’s iPhone 7/7 Plus are also worth taking a look at. Both the S8 and the S8+ are taller then the iPhone 7 and iPhone 7 Plus, but as expected, the S8+ is narrower by a good 3.90mm when compared to the iPhone 7 Plus. As for the S8, Samsung has done an impressive job of putting a 5.8-inch display into a physical frame which is less than 1mm wider than Apple’s iPhone 7. Samsung has its Galaxy Unpacked event planned for March 29th in New York, where both new flagship smartphones will be unveiled to the public. The S8 is only 2mm taller than the iPhone 7 yet has a display that is one inch bigger and twice the resolution. 85% vs 66% screen to body ratio. I for one welcome our Android ocerlords. I want to see front comparisons for everything, IDGAF about the back.. I want to know where the bezels line up to each other while they are all standing on the same line.